Share Paul Gabriel Blues Trio's EPK! An intimate stage, this week from Wednesday to Saturday, April 4-7, it will present “The Journey of E,” an anthology of the history of jazz and an homage to Edith Piaf, hence the E in the title. Written, directed and performed by Marcel Blanchet and his quartet Beyond the Sun, the audience is taken on a trip through history from the pre-Depression years of 1928 until 1945, in America and across the pond to Europe. Marcel plays a newspaper boy who uses the day’s headlines as stopping-off points for a musical cavalcade of numbers, starting with Louie Armstrong’s “West End Blues.” Blanchet calls Armstrong the Michael Jackson of his age. As he hawks his papers, he travels along New York City’s Great White Way and picks up fellow musicians Ryan Larson on keyboard and Jedd Chlebowski on bass to join him on drums. When chanteuse Carolyn Raming strolls down the boulevard, his quartet is complete. By Donna Doherty, Register Arts Editor. High energy and marvelously entertaining, Marcel Blanchet is the quintessential Renaissance man who can also pull in a crowd. His intriguing mix of talents (jazz musician, writer, speaker, and multi-media producer) is one reason why Beyond the Sun is in such demand for corporate events, city festivals, and intimate shindigs. And when it comes to creating radio and TV commercials, Marcel is a natural. He wows listeners with his originality and virtuosity as a performer. With a new Christmas CD, Guilford's Marcel Blanchet captures the spirit of the holidays in a way that truly embodies good will toward others. 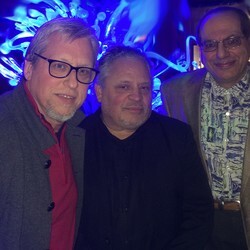 The talented jazz musician and producer and his jazz group Beyond the Sun will give 100 percent of sales of the 1,500-copy first release of their new holiday CD Somewhere Paradise to the ALS Association, Connecticut Chapter. "There are just a lot of beautiful people out there," says Marcel, who also thanks Beyond the Sun and the CD's guest artists. Marcel's college friend John Tuzzolo (Johnny Ray) co-wrote the title cut with him. Ray sings the lullaby on the CD. "That song is a gift of love. I wrote it over 30 years ago, as a gift to my mom's sister, who was having a baby. Now that baby's an adult and she's having a baby, so the song's become a gift of a gift," says Marcel. Beyond the Sun consists of Marcel (drums), Kalim Zarif (keyboards), Morris Trent (bass), and singer Carolyn Raming. The jazz group gigs in this area, across the country, and around the world, from Los Angeles to New Orleans and from Berlin to Brazil. "We do a lot of fundraisers…It's part of my philosophy. It gives me an opportunity to be a voice for a good cause and at the same time entertain and bring an audience to jazz," says Marcel. New Haven, CT -- Marcel and Beyond the Sun produced by UR iT Productions, and World Wide Arts' Independent Coffee Network a music video entertainment provider, have announced a licensing deal which will use the Jazz Quartet's New CD release “Black Coffee" in its promotional music videos. The licensing deal will broadcast Marcel and Beyond the Sun's CD Black Coffee in independent coffee houses though out the United States. World Wide Arts provides independent coffee store owners with an HD flat screen television that delivers fresh and engaging content with music via broadband. The content also includes appropriate short messages from brand marketers to promote their products and services. The Independent Coffee Network mission is to serve thousands of independent coffee stores as one, creating a powerful independent group of stores. “We are very excited to see the interest in our New CD Black Coffee and we feel our music really fits this market, said Marcel Blanchet, drummer/producer. We hope that we can visit many of the independent coffee stores that play our music and perform in concert in these areas to say thank you to our new audience"
World Wide Arts created the Independent Coffee Network with a simple proposition: give the independent coffee store owner a unique and original media product, differentiating them from ubiquitous chain stores and connecting the fiercely loyal and independent consumer with the indie business owners. WWA aggregates original musical content from all genres and delivers the first and only network of original artistic video content to independent coffee store owners. The independent Coffee Network brings coffee customers thought content that is contextual to the coffee house environment creating better engagement for customers and marketers. Marcel and Beyond the Sun just released their new CD “Black Coffee" and will be performing in concert July 5th, in Guilford, Connecticut, “Jazz on the Green", sponsored by the Shoreline Alliance for the Arts. 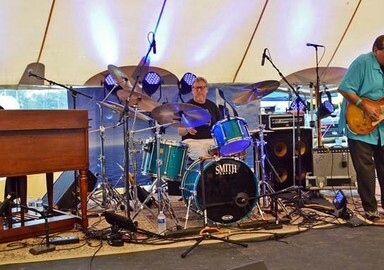 One of the Largest Jazz outdoor concerts on the Connecticut Shoreline. Marcel and Beyond the Sun are featured in the Jazz Musical "The Journey of E" an anthology of the history of jazz and an homage to Edith Piaf, hence the E in the title, The show brings the audience of today from the era of prohibition in America, through the hard times of the great depression on a voyage to Europe where the alluring Parisian influence of the "chanson" begins. In Paris, the city of light and love, where romantic music of the late 30's and 40's is brought to life. Marcel & Beyond the Sun is a Contemporary Jazz band, playing Concerts, Shows, Festivals and Clubs throughout the United States and Europe. They have appeared on ABC, CBS and NBC and their music has been used on American Airlines and Delta onboard jazz radio and has been licensed to the Independent Coffee Network and Whole Foods Markets. Their show includes the very popular "chanson" style, jazz vocals and rhythmic middle eastern grooves, including many originals. Beyond the Sun's shows and concerts have a contemporized edge with use of multimedia and vocalists. Beyond the Sun is a well-rehearsed show performing to small and large audiences and is well received and has been used for corporate events as well as private Jazz Parties. Marcel, drummer and producer of BEYOND THE SUN , has put together a show that has specific themes for seasonal performances and can be customized as well for special events. Their music is from their recordings, some original and many classic jazz sounds, sometimes during bigger shows and upon request, they are using special lighting and multimedia video during their performance; it makes a BEYOND THE SUN show an exciting audience experience. 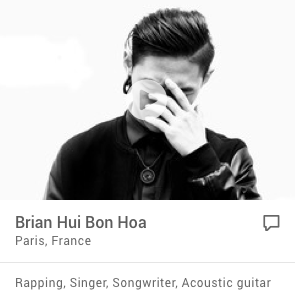 While studying at Berklee College of Music, he became involved in and studied Commercial Jingle writing. He began working with the television station WJAR TV 10 in Providence Rhode Island, writing jingle and news intros, and recording commercial spots. This led him down the road to recording drums and percussion for others, including touring and playing drums in the Broadway shows, Ain 't Misbehavin ', Guys and Dolls, Jesus Christ Superstar, Joseph and the Amazing Technicolor Dream coat and ElJohn a Tribute to Elvis. After moving to Florida and getting involved with CBS and the Miami sound in the early 1980s, he started recording and performing with CBS recording artist, Richard Williams and MCA recording artist Tony Chance. Working with Eddie Fisher, the Ink Spots, The Platters and playing shows, night clubs, concert halls and going on the road touring with many touring acts and shows. Marcel landed in Nashville, Tennessee, where he continued recording jingles, Radio and TV commercials sound tracks and production music used in documentaries and corporate presentations and started to work with SONY Tree Productions, I was recording for songwriters who wanted to land their own recording deals". Sony/ATV Music Publishing Nashville, works include Brooks & Dunn, Lee Ann Womack and Blake Shelton and many others. Marcel is now in demand as a drum clinician motivational speaker. Endorsed by SPAUN drums, Zildjian Cymbals, Amedia Hand Hammered Turkish Cymbals, PEACE drums and percussion, Vic Firth Drumsticks, Prentice Practice Pads and Billdidit Coady Clutch. Marcel is known as an expert in the field, he demonstrates new drum and percussion products and uses his drumming skills to motivate his audiences to keep on striving for greater accomplishments. Sharing his story and lessons learned with audiences of all ages, he strengthens attitudes and helps build creativity. 1. Frere Jacques – A teasing rhyme to mock the Dominican Monks, in France the Jacobin order, known for their sloth and comfortable lifestyles. Mahler used it as the basis for the Third movement of his symphony #1. 2. West End Blues – 1928- Joe “King” Oliver, set on the shore of Lake Pontchartrain in New Orleans, a thriving weekend summer resort with dance pavilions. One of Louis Armstrong’s recordings with Zutty Singleton (where it was repeated several times) was scratched because Zutty dropped a cymbal (which Louis never let him forget!). 3. Love Me or Leave Me –( C ) 1928 – introduced on Broadway in play “Whoopee”. Walter Donaldson and Gus Kahn. 4. Bei Mir Bist Du Schon 1932 – first performed in states at the Apollo Theatre in Harlem, popular in Nazi Germany until its Jewish origins were discovered.